WASHINGTON (JTA) — A number of Arab states heeded the plea by Nikki Haley, the U.S. ambassador to the United Nations, to focus more in a Middle East debate on the threat posed by Iran than on the Israeli-Palestinian conflict. Haley, the president by rotation this month of the U.N. Security Council, convened a council session on the Middle East. “How one chooses to spend one’s time is an indication of one’s priorities,” she said in her opening remarks. All U.N. member states — not just the 15 on the council — were invited to deliver short addresses on the Middle East. The plea appeared to resonate with a number of states joining the debate, including the United Arab Emirates and Saudi Arabia, as well as European states and some in Africa, including Ethiopia. These states did not ignore the Israeli-Palestinian issue, and were often critical of Israel, but the greater part of their addresses looked to the threat posed by Iran and its allies in the region, with a special focus on Syria, where a sarin gas attack killed 89 civilians earlier this month. Western states have blamed the Assad regime, allied with Iran, for the attack. Other nations, including leftist governments in South America like Venezuela, as well as South Africa, focused more on the Israeli-Palestinian conflict. The South African envoy said the Security Council “should not stray away from the core issue” when discussing the region. 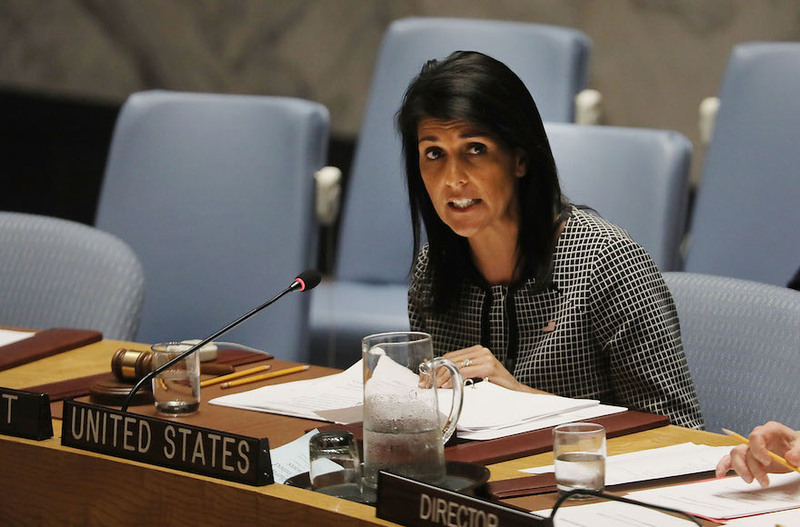 Haley has said repeatedly that the United States will no longer tolerate anti-Israel bias at the body, a key difference between the Trump administration and its predecessor, the Obama administration, which sought to tamp down anti-Israel bias through quiet diplomacy. Haley was behind successful efforts earlier this year to get the U.N. secretary-general, António Guterres, to withdraw a report by a U.N. affiliate that likened to apartheid Israel’s occupation in the West Bank.